ALISON: You can't take anything seriously! You know, you didn't even read the baby books. B: I didn't read the baby book! What's gonna happen? How did anyone ever give birth without a baby book? That's right. The ancient Egyptians #@$%ing engraved What to Expect When You're Expecting on the pyramid walls! I forgot about that! Who gives a flying #@$% about the baby books? ALISON: It just shows your lack of commitment...that you're not in this with me! Ever since we found out we were pregnant, we’ve been in complete information-overload mode. Alison, in particular, began consuming as much information as she possibly could even before conception. (There was a special trip to Barnes and Noble even then to purchase What to Expect BEFORE You’re Expecting.) Now, with What to Expect When You’re Expecting (the “Baby Bible” as I call it) a fixture on Alison’s nightstand along with multiple iPhone apps, thebump.com, and babycenter.com, there is definitely no shortage of content for us to consume in an attempt to prepare us for whatever the future holds. I would say that both Alison and I are pretty much equally curious about all this stuff, so we are both willing to do plenty of research on a topic and read as much as we can find to educate ourselves. This is especially true because it seems like there is just so much to know and we were basically clueless before this experience started. When it comes to information consumption, there is one key difference between the two of us. I think the best way to explain it is this — Alison wants to know right now all the information she needs to cover the next 2-4 years of the child’s life; I’m interested mostly in what I need to get me through the next 2-4 weeks of time. Frankly, that’s about all I can really handle. But the good news is, as usual, we’ve balanced each other out pretty nicely. Thankfully, Alison my wife isn’t nearly as demanding as Alison from Knocked Up, but the “Baby Bible” is always right by the bed if I’m interested in looking. Plus, like I said, there is plenty of knowledge to be had from online resources. Still, I’m happy to report I am indeed reading my own version of the “baby books” courtesy of a very thoughtful gift by my amazing wife. I’ve got two books by my bed and I really do love them both. My Boys Can Swim is a super easy read with a light and humorous tone. It’s very short, but it’s broken up by trimester and just does some general expectation-setting about what the mother is going through and what you should know. It’s entertaining and funny while still being helpful and informative. I’ve pretty much read the entire thing three times and I’ve enjoyed it a lot, especially when I’m itching for info but looking to lighten things up. The Expectant Father on the other hand, is the “Baby Bible for Dads” in my opinion. It’s a fabulous resource and I can’t recommend it highly enough if you’re a dad-to-be. It’s broken up by month and in each section it gives you an overview of what the baby is going through, what the mom is going through (both physically and emotionally), and most importantly, what you (the dad) are probably feeling and thinking about. Then each chapter goes into some topic of fatherhood, and it’s honestly uncanny how many times the book has been absolutely dead on about what’s going on in my head during any given month. Trust me, it’s not random…it’s calculated. Things like financial stability, work-life balance, feeling the baby move, taking care of your wife…it somehow places the right topic in the right month to be in sync with my brain (and many dads-to-be brains I’m sure). I try to stay about a month or two ahead of real-time (I’ve read through half of month seven) and I typically read each chapter two or three times (repeating it once every couple of weeks of the month) which, like I said, is about as much as my information tank can hold at a time. 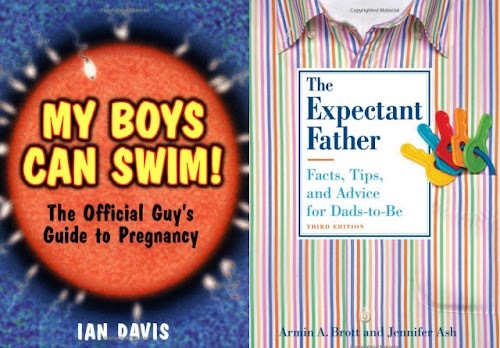 Anyway, I wanted to share what I’ve been reading because dads don’t have it as easy when it comes to “baby books.” What to Expect When You’re Expecting can be a bit much at times, and most of the web sites have a grand total of four or five pages dedicated to expecting dads…and they get old fast. So these are my recommendations. Happy reading!